I can hardly claim to have worked professionally with 10BASE5 as when I first started building my own 10BASE2 networks in 1997, 10BASE5 was long obsolete. Back then, I knew about 10BASE5, but it wasn’t practical, affordable or interesting enough for me to attempt building one. Fast forward to 2012, and 10BASE5 is now truly a vintage technology. Anyone studying something I.T. related likely will at some point have been told about this stuff, because it’s very important in the history of computing. 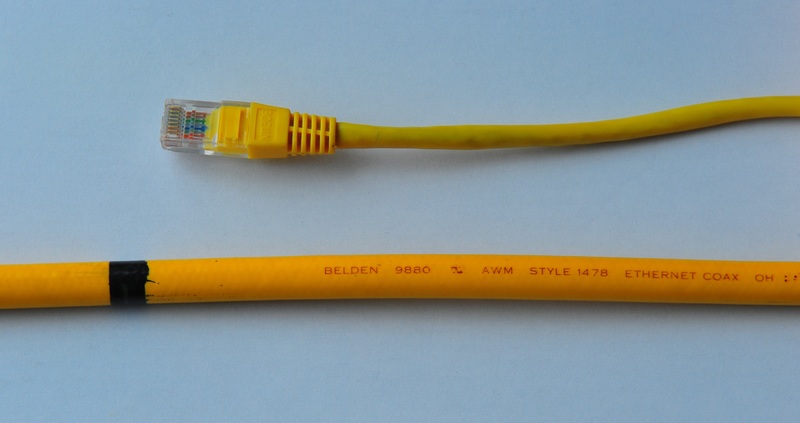 This was the first standardised, commercially used form of Ethernet, and today, almost the entire Internet is Ethernet, but heck, who’s ever actually seen a working 10BASE5 setup? Not me, that’s for sure, nor or anyone I’ve ever met. I’ve written this page primarily for people like myself, who came into the computing scene just a bit too late to have ever seen this technology in use. A 1980s network engineer can safely skip this page. 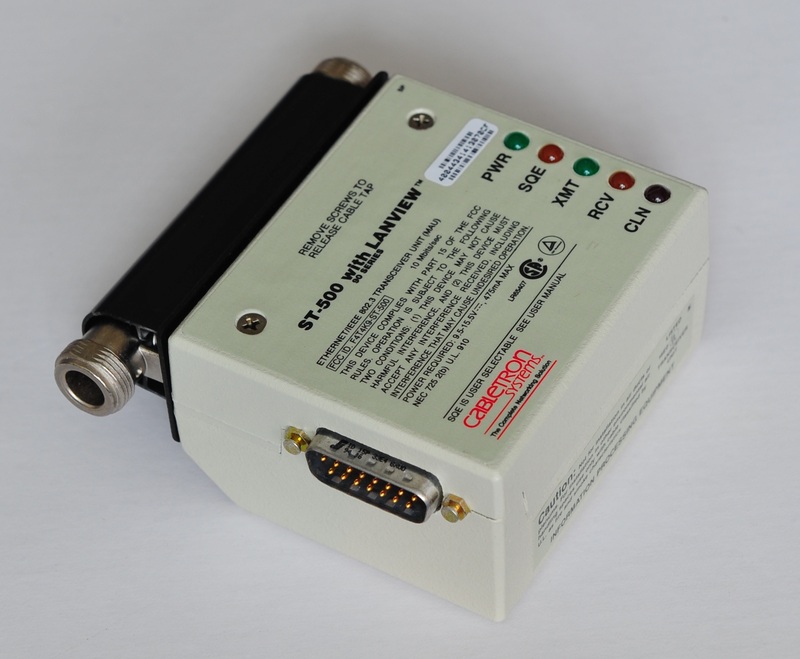 In order to connect to a true 10BASE5 network, network adapters with AUI are required. AUI stands for Attachment Unit Interface. It is in effect, a media independent form of all of the physical 10Mbit ethernet variants, which I shall call 10BASE-X. 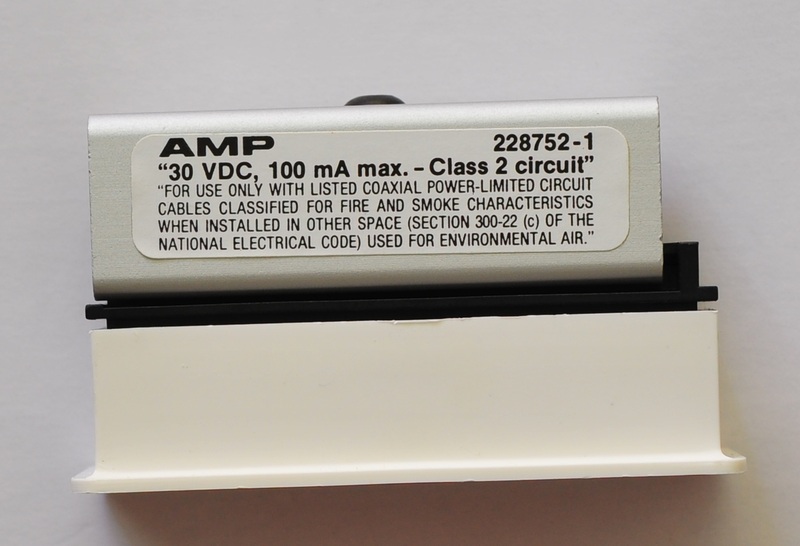 AUI was to 10BASE-X what MII is to 100BASE-X, with the exception that MII is rarely found as an external connector. 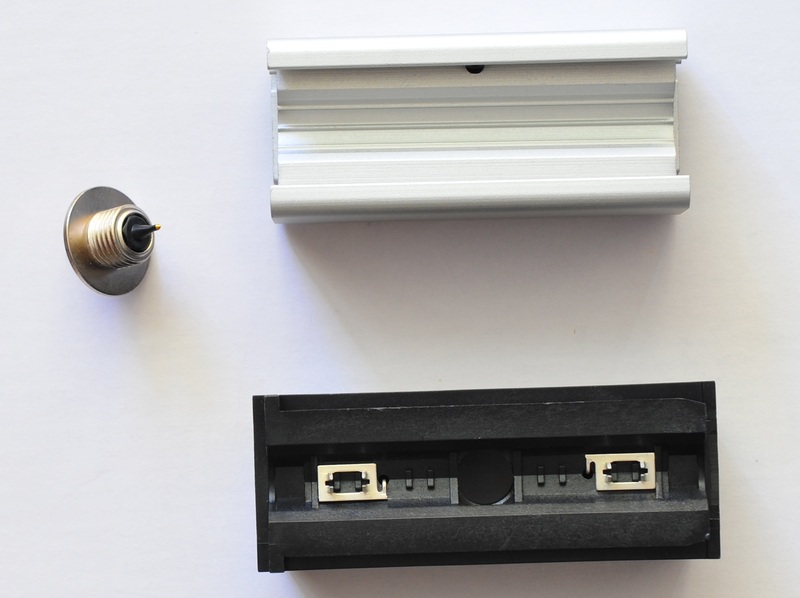 Unfortunately for this project, networking equipment with external AUI connectors is becoming rather difficult to find. While this can be done, modern mainboards with ISA slots are niche and very expensive. I ruled out this option. 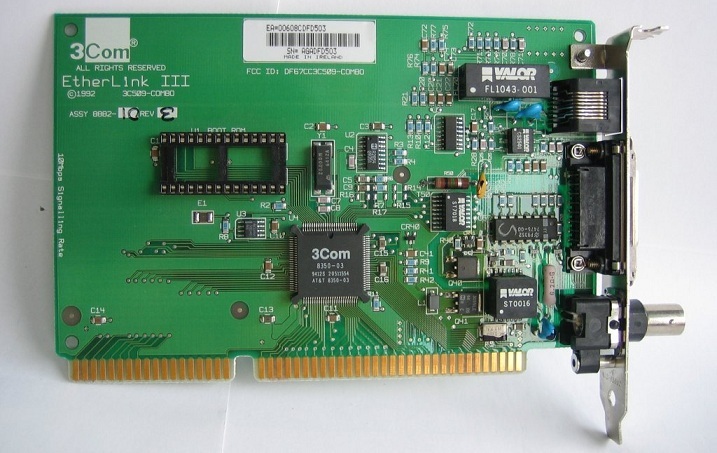 Fortunately, some modern PCs still have 32-Bit/5 volt parallel PCI slots, also, PCI and 10BASE5 had enough overlap that a small number of products were manufactured. A couple of examples are the 3Com 3C900B-COMBO, and 3C905B-COMBO. At the time of writing there were a fair few of these on eBay, but often for outrageous sums of money. Fortunately I managed to pick up a couple for a few quid. 64-Bit Windows drivers do not exist, making Windows 7 32-bit likely the last version of Windows able to make use of them, short of writing some new drivers. All versions of Linux will work OK with these. As far as I can tell no USB product was ever made. With 10BASE5 MAU’s requiring 12 volts and some 5 or more watts of power, over and above what USB can provide, this would be a problematic proposition. 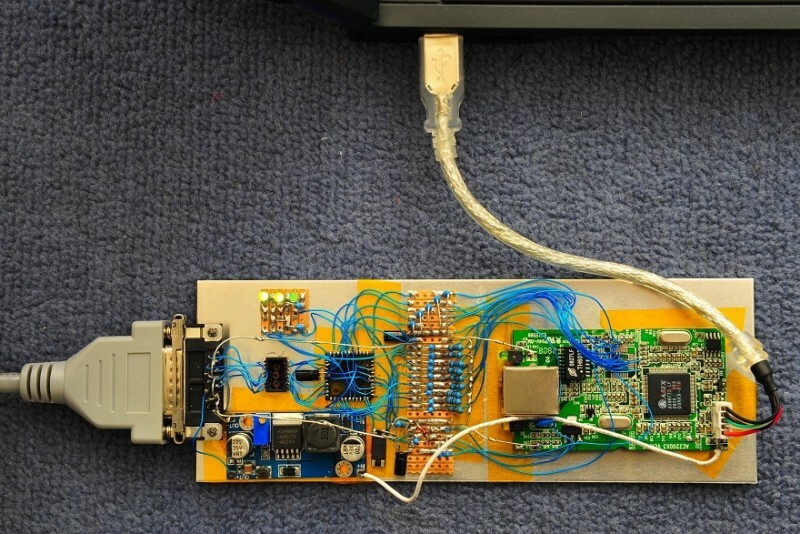 Also, no single chip “USB with AUI” solutions exist. From my research, it seems theoretically possible to create a 2-chip adapter, with external power supply, but apparently there is no market for such as a thing. A D-Link DUB-E100 with its 100BASE-TX PHY removed, and an NQ8502 frankensteined in its place. This image illustrates my key design objective: To give an AUI interface to a USB Ethernet MAC, instead of converting from 10BASE-T. But that didn’t stop me from building one. Above is what is quite possibly one of the worlds only USB Ethernet Adapters with AUI interface. I have a seperate project page for this here. 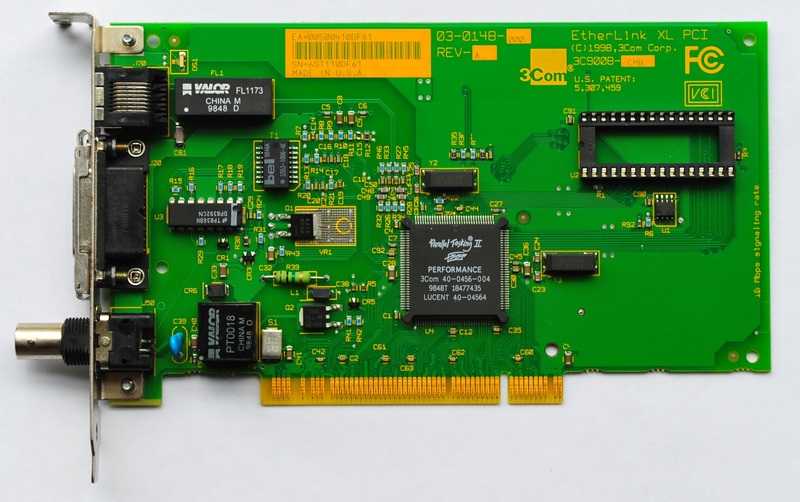 A Cisco NM-1E2W module could be used if one has a large ISR kicking around. Using a 10BASE-T hub with AUI to bridge to a twisted pair network is probably the easiest approach. There’s thousands of these for sale on eBay for peanuts, but in my case, having one of these on each node would make the setup rather clunky. What I was really looking for was a few of these little boxes. Easily mistaken for a 10BASE-T MAU, these (unlike the former which tend to be spilling out of every I.T. junk box in the land) are fairly uncommon. An Allied Telesis MC12T next to an ordinary 10BASE-T MAU. Spot the difference? A common belief persists that 10BASE5 used RG-8/U cable. This, for the most part, appears to be untrue. The cable used was purpose designed for 10BASE5 and manufactured by Belden under the part number 9880 (A few other compatible cables may exist). The reason #9880 cable was specified is that several variants of RG-8 exist with varying dimensions and manufacturing standards. Given that the main form of connection of MAU’s to 10BASE5 networks was by the precisely designed prongs in “Vampire taps”, cable dimensions and dielectric consistency had to be spot on. 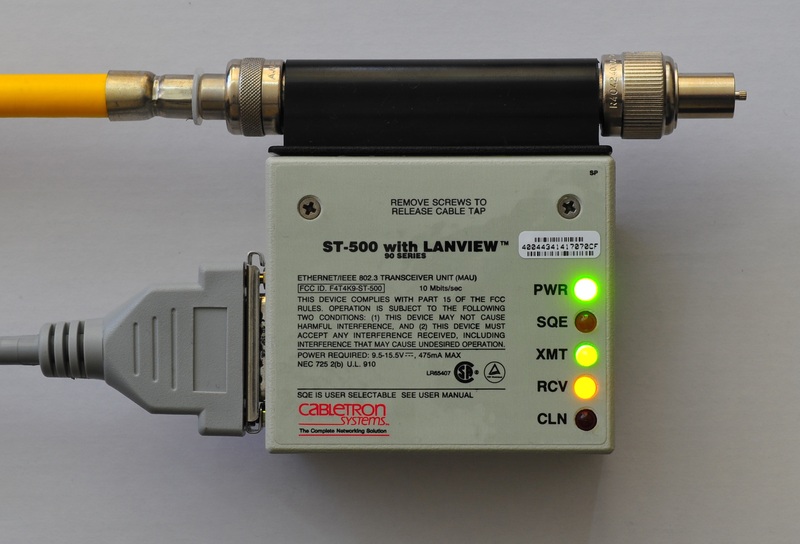 A network designed using only intrusive N connector taps such as AMP 221914-1 could get away with using pretty much any 50 ohm coax, but then the sum total of insertion losses created by each node may prevent the full 500M segment length from being achieved. Also, this approach wouldn’t permit addition of new nodes without bringing down the network. After an evening of wrestling with RG-8/U cable (why oh why didn’t I just buy RG-58) while attempting to make a short test lead, I think I’ll stick with the Vampire Taps. For someone like me who hadn’t encountered it before, no amount of looking at pictures could prepare for how big this stuff is. Short of high power transmission cables, it’s the largest coaxial cable I’ve ever seen. It is also very heavy, rigid and the bend radius is absurdly large. Another interesting feature of this cable is the black bands which appear every 2.5M. 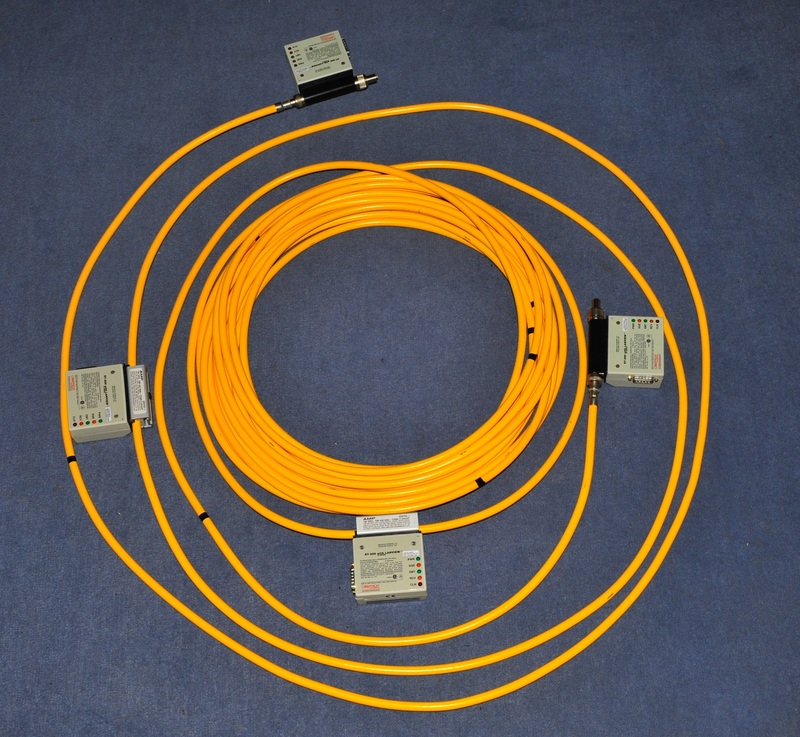 In 10BASE5 networks, MAUs can only be attached at 2.5M intervals, this is to ensure that signal reflections generated by taps stay out of phase, which stops them compounding across the whole segment. In a small network such as mine, it’s probably not so important to respect this tap placement rule, but I’ll respect it anyway. 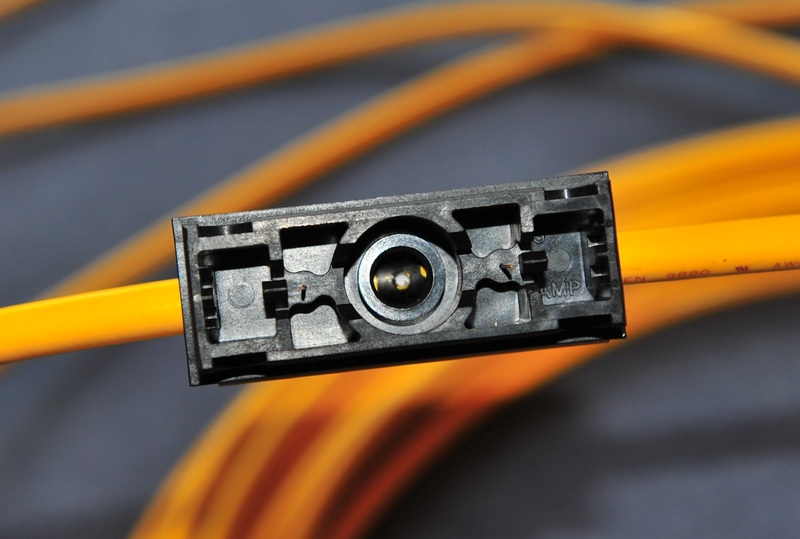 Unlike the BNC connectors found on 10BASE2, the official connector used by 10BASE5 (where connectors are required) is the N connector. 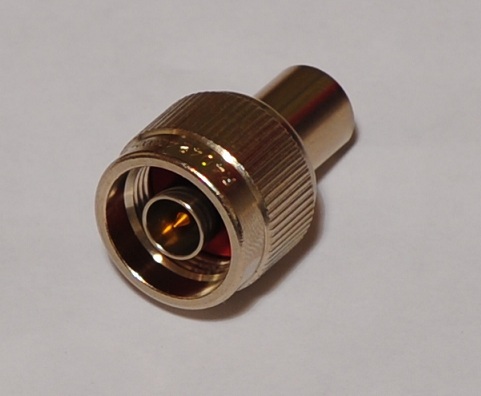 While still used extensively in lab/specialist environments, this large coaxial connector isn’t something the average ‘tech dude’ is likely to encounter these days. They perform exceptionally, have an intrinsic impedance of 50 ohms, are fairly common/inexpensive and easily handle the large sized #9880 cable. 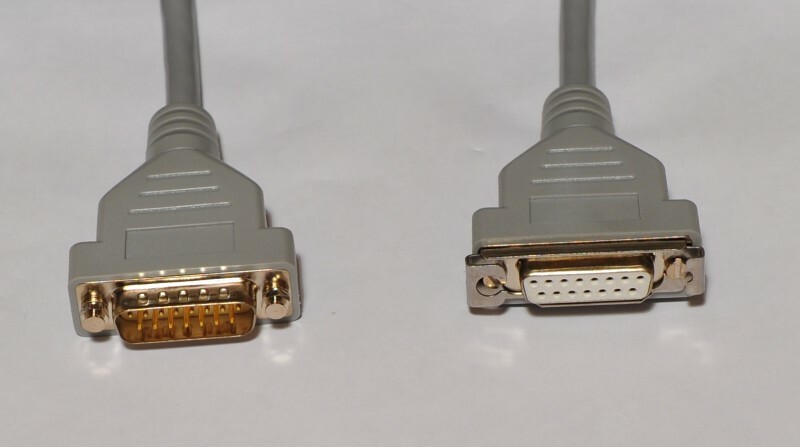 These cables sporting male and female 15-pin D-sub connectors, connect a node to the MAU. Since the MAU is bolted to a rigid behemoth piece of coax, it wasn’t exactly convenient to try and drag that lot down to the back of a PC, so these cables bridged that gap. With a maximum length of 50 metres, that gap can be very large indeed. Also, given that taps could only be placed at 2.5M intervals, a world without drop cables would lend its self to much humour around the office, at the expense of well-intended PC and desk placement considerations. 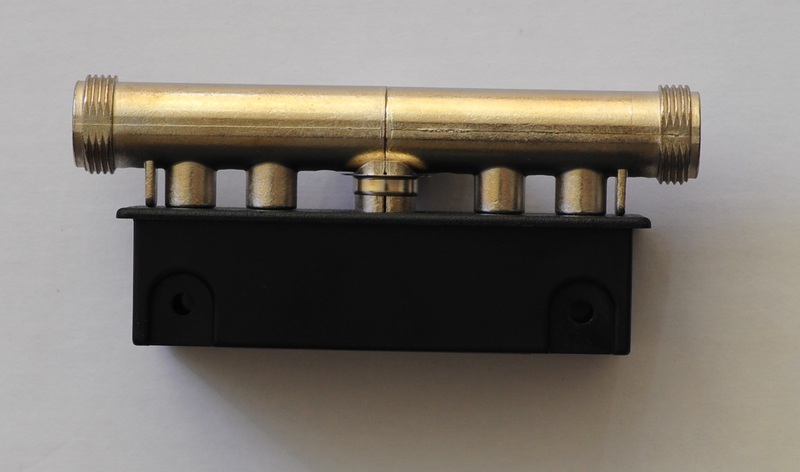 One notable feature is the slide locking mechanism used in place of the usual UNC 4-40 screws. It is my personal opinion that the design of this mechanism is a bit daft. In theory it’s a good idea but in practice I think it was implemented too flimsily. 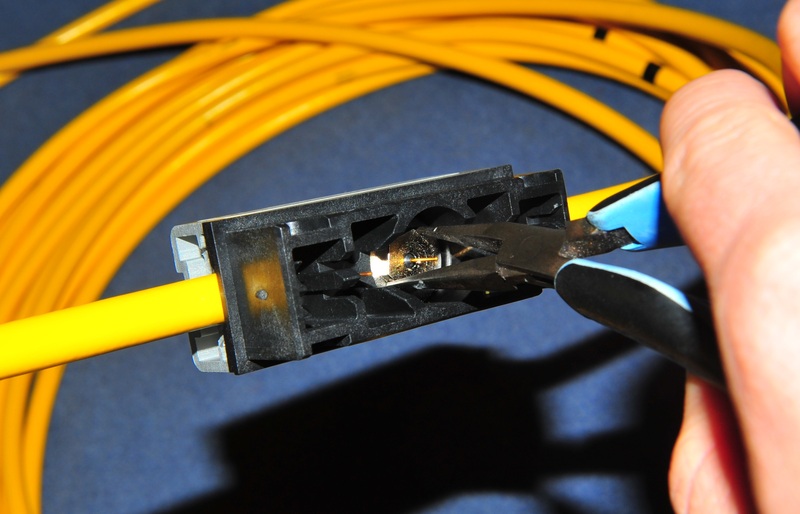 AUI drop cables are often very large and rigid (likely thanks to a half a dozen layers of shielding), so much so that a mild sideways nudge on a cable can easily rip a latched connector straight out of the socket, bending/breaking the mechanism. They also have a feature that the screws in the female end often work their way out over time, inevitably to be lost forever. Even during this small scale project, I have suffered some grief over these locking mechanisms. I can imagine they were a source of many support calls in the 80s and early 90s. I chose Cabletron ST-500’s, because they have blinky lights. The ST-500 (90 Series) would have been one of the last and most modern 10BASE5 MAUs manufactured. The internal component count (when compared with, say, a DEC h4000) is low. 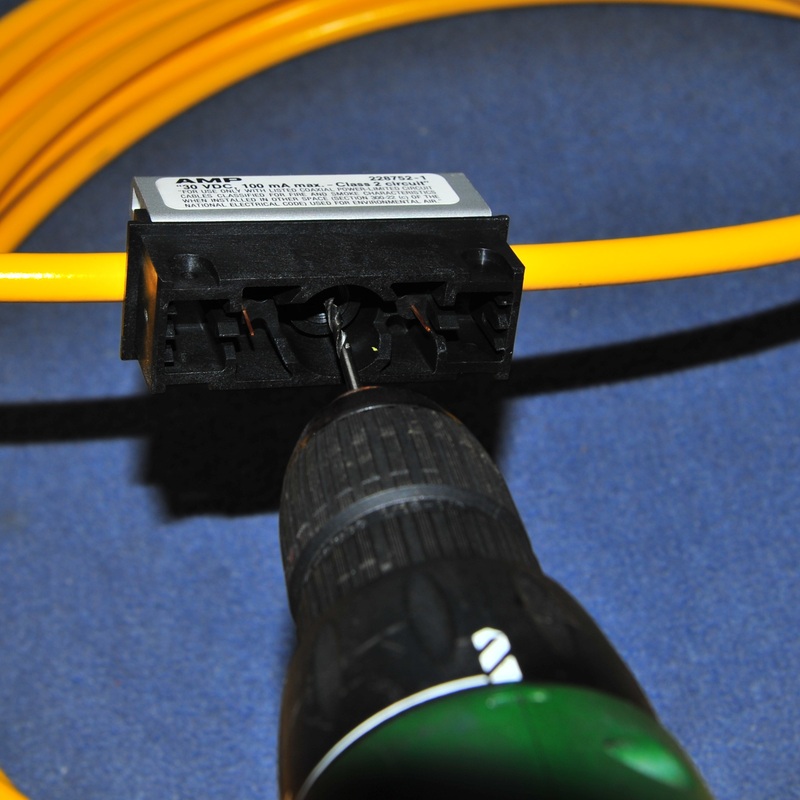 By far the most common means of connection to the coax segment. The bottom half is plastic, I assume to eliminate ground loops by ensuring the braid remains electrically isolated from the metal case of the MAU. The top half is extruded aluminium. Each contains three prongs (two to connect to the braid, and one to the centre conductor). 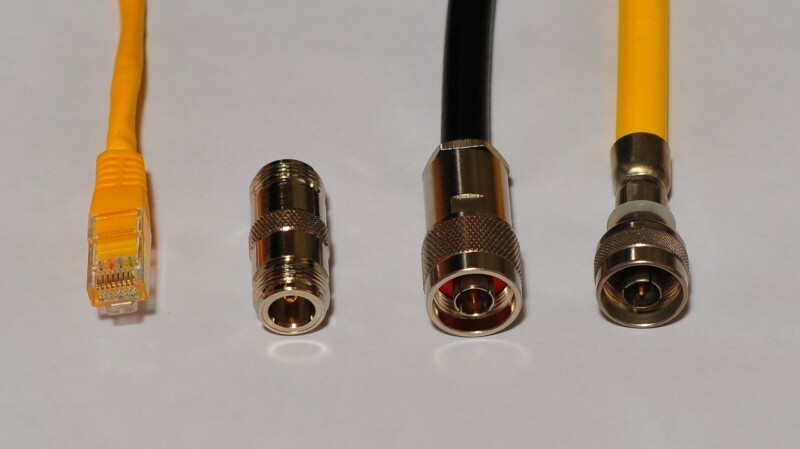 To me, the idea of using this style of connection to coaxial cable is ambitious, but it has to be said that a few spikes in a coaxial cable will equate to significantly less reflection and insertion loss than cutting the cable and running through a couple of N connectors. I can imagine perfecting these taps was quite a headache for the designers of this system. 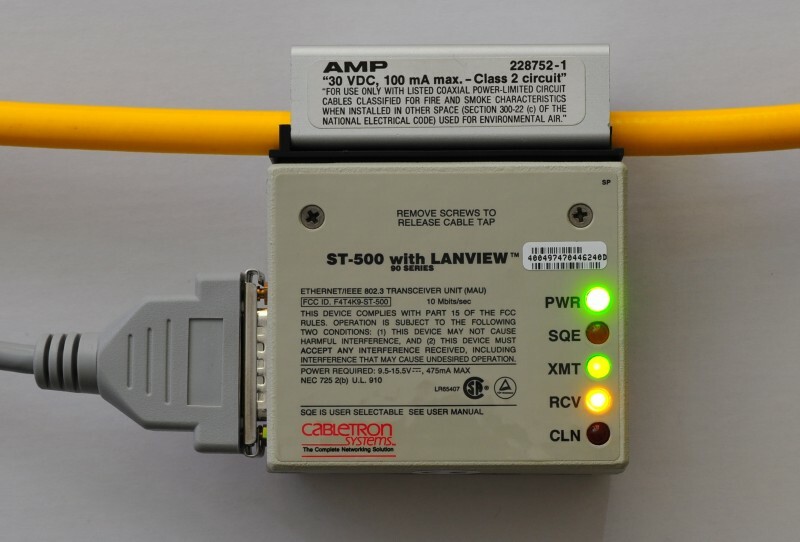 Not having seen one of these networks, or knowing anyone who’s built one, unfortunately I do not have any information on what the typical use-case of this style of connection was. They’re almost never seen for sale on eBay standalone or attached to a transceiver so from this I’d assume they were seldom used. Like 10BASE2, 10BASE5 networks have to be terminated and earthed at one end, and terminated only at the other. 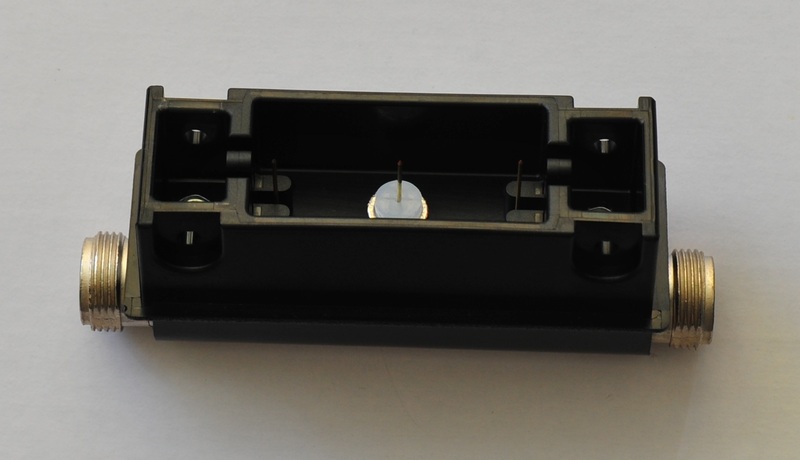 Termination was a piece of cake on 10BASE2, simply a case of fitting one onto the unused ends of the tee connectors at each the end of the segment. In a 10BASE5 network with every node on a vampire tap, this wouldn’t have been quite so easy. I don’t have any information about how these networks were terminated in a typical scenario but I guess an N connector would have to be crimped onto a short pigtail just beyond the last node, then a female to female coupler and terminator fitted (or a female terminator?). Personally, I think terminating with an MAU and an N connector tap is much nicer but I doubt this was done often in practice. I spent many hours on eBay over several months trying to find these. I did eventually obtain 3 identical MiLAN MIL-130A units which by the look of it, had been knocking around in someone’s junk box for an awful long time. MIL-130A is one of only a small number of products ever manufactured to perform this conversion. 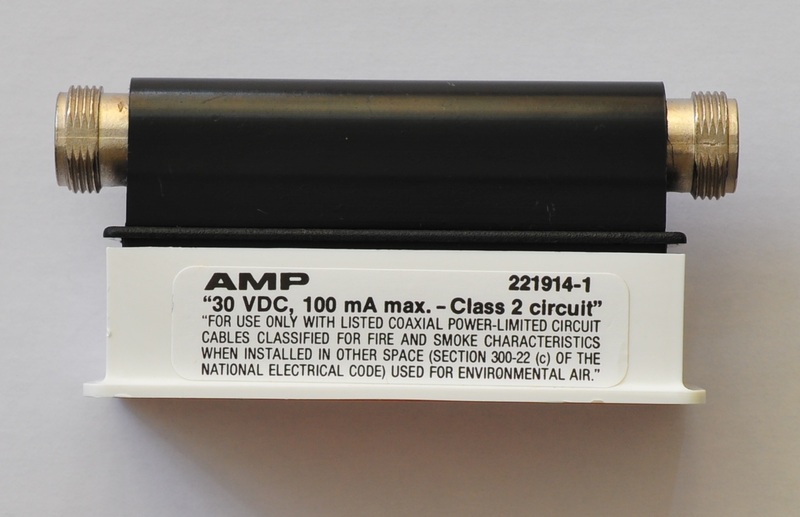 The key differentiating features from a 10BASE-T MAU are a female AUI connector, and a power input socket. They are in effect, a full Ethernet Repeater. They’re based on a rather special, long-obsolete chip, the LXT906PC, which is designed exactly for this purpose. Normally there’s a coring tool which is used to drill down to the dielectric. Fat chance I was going to be able to get my hands on one of those. I’d have to do with a cordless drill. At first I thought this might be a bit dangerous but it actually worked pretty well. Just a few turns of the drill bit were all that were required to cleanly drill down to the top of the dielectric. If the drill has anything less than a very fine speed control, this is best done by hand. To my surprise, the network was passing traffic within seconds of first power on. The Vampire taps had worked perfectly and my terminators appear to have done the trick nicely. Just for kicks, I installed the second Vampire Tap with the network running, streaming video on one of the PCs. Not a single interruption! 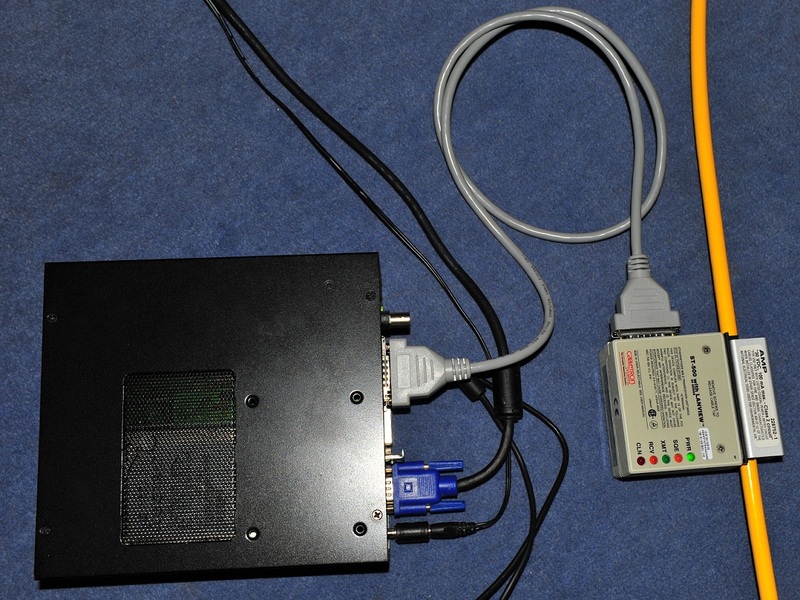 Using 10BASE-T media converters and RG-8/U cable. I’ve been very impressed with the workmanship of all of the components involved in this setup. Everything I have here is “Made in U.S.A.”. I very much doubt that many gaming LANs would have taken place using this technology. Akin to wrestling with a giant anaconda, this stuff is big, bulky, expensive and generally quite difficult to deal with. It requires a lot of patience to assemble and once it’s assembled, you’re stuck with whatever configuration you built it in. No wonder I never came across it in my younger years. That said though, I’m happy to own this fully functioning piece of computing history. The stuff you are showing is quite the same, we used that time! 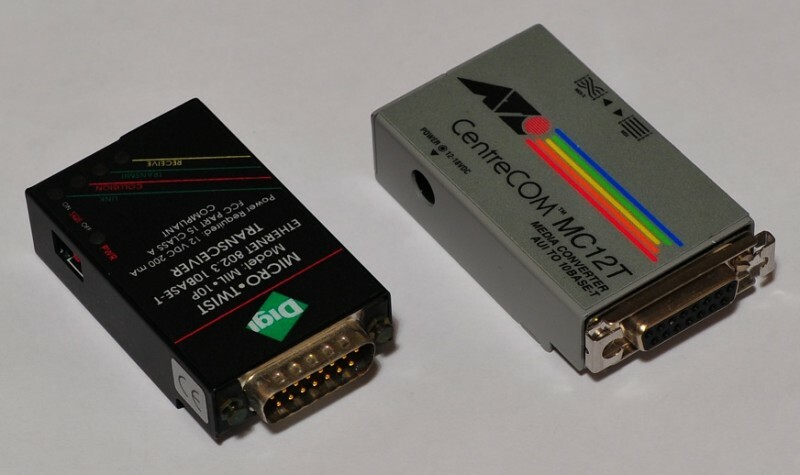 Apple was using some kind of AUI in classic mac machines to the end of the 90ties, it is with different connectors, but physically identical, so there should be lots of stuff on the (flea)markets of AUI to 10B2 and even RJ45 (10B-TX) ethernet! Digi was a good brand for all interconnection stuff that time! Apple called their proprietary mini AUI connection AAUI, mostly used on Macs with 68040 and pre-G series PPC CPUs. Great article, and takes me back .. I’ve installed km’s of 10Base5 in my time, and enjoyed your observations like it was 1986 all over again ..
One small thing though: for sure multiplayer gaming has occurred on these kinds of rig, without a doubt: in the bad ol’ days of DOS, 10Base5 (and -T) was actually quite a common configuration for small to medium (and larger) offices .. and don’t forget, DOOM and others like it started multiplayer gaming revolution as well as the network revolution. A lot of people only had network cards like this just so they could play DOOM, heh heh … Well anyway, I know of game sessions that occurred in offices all over California back in those days, and 10Base5 was well in use back then .. This brought me back….I predate 10base5 and in fact networks and even (CRT) monitors. Big batch mainframes. DOOM. As a clever contractor, I had occasion to debug a military LAN (mix of thick/thin and bridges/repeaters on an army base. 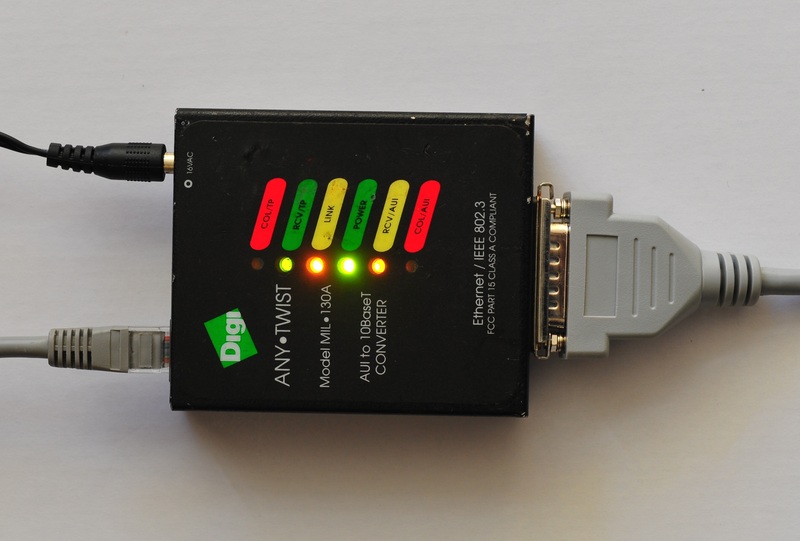 I used an early LAN sniffer to find out why the whole LAN was ubiquitously running like a dog. I just couldn’t see the amount of TCP/IP packets that would keep it busy enough to grind. Then I accidentally switched the thing to IPX mode. Suddenly SHEDLOADS of packets. Invisible to TCP/IP but sharing the same wire. Worse the were BROADCAST packets that EACH hit every NIC on the lan at MAC address level. I pulled some ascii out and found “DOOM” everywhere. So much for highly secure. Doom simply didn’t run on TCP/IP but the squady’s had no idea how they were getting away with it. Both TCP and IPX used CSMA/CD, which tends to increasing thrash when the LAN is busier than 30%. Anything over 70% became exponentially unusable. I always found 20% was the make or break point for any network over 100 meters. To give you an idea how long ago this went out of fashion, I took a Novel CNE classes in the fall of 1994, they showed us a vampire tap and explained all about 10Base5, but we didn’t do anything with it, unlike 10Base2&10, and TokenRing. All the time I have been thinking how cool a 10Base5-based installation would be. I haven’t been able to find any parts for that locally so for now I’ll stay with the 10Base2. Again, nice story and thanks for sharing this! Fascinating! I started in networking right around when 10baseT was taking off, but we made our first network using 10Base2. We considered Arcnet until we saw the bandwidth. Thank you for taking me through 10Base5. It was a great read. I actually still have all the gear, wiring, terminators and even the two switches that have 10BaseT, 10Base2 and even an AUI on them. The fans are a little loud and some of the ports have gone bad, but they’re still powered on right now. I never got to play with Token ring, so that should be your next project! Man, this takes me back. I actually did a lot of this back in the day for the Army National Guard in a state which shall remain nameless (but it rhymes with Blevada). We bought a 1000′ spool of RG-8 cable, and it weighed several hundred pounds. Had to tote it around with a forklift. IIRC, we had only used about half of it by the time the network transitioned to 100BaseT and we started installed cat 5 cable everywhere. About the terminations, I’m pretty sure I remember that one of the unwritten rules was not to terminate your cable at a tap. So the backbone would just keep running past the last tap, you stick an N-connector onto that, then just plug in a terminator with a male-male N-type adapter. For extra credit, set up on Intel OpenNET server on a 286 Xenix Server (like I did). One more thing, there were hubs that you could attach multiple AUI drop cables to, then just run one AUI drop cable to the backbone, so every workstation did not need it’s own backbone tap. I don’t think we called them hubs back then, but that is basically what they were. 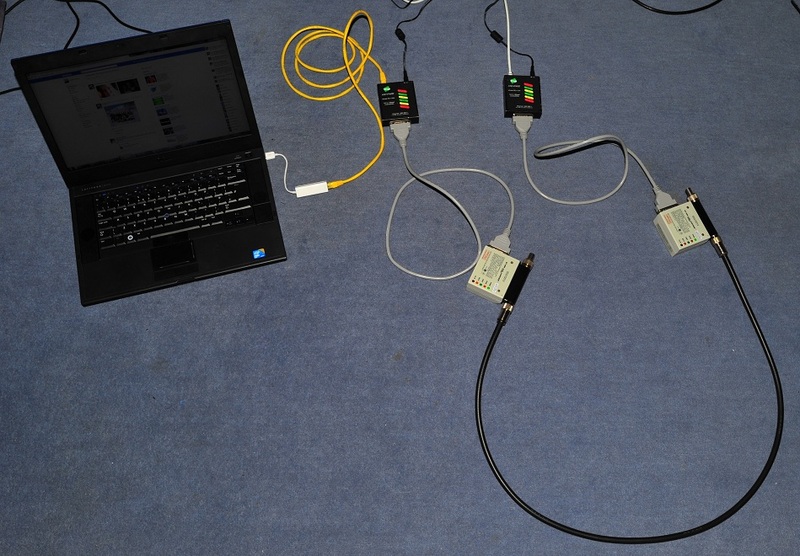 And all the ports shared the 10Meg bandwith. Hello, I found this article a great throw back for me and I chuckled at the USB eth aui adapter you build. Way to go. My oh my, not only do I remember this stuff from back in the late 80s, the place I work at now still has some of it lying around in our store room. One of our ancient routers still has an AUI to 10baseT media converter in use! 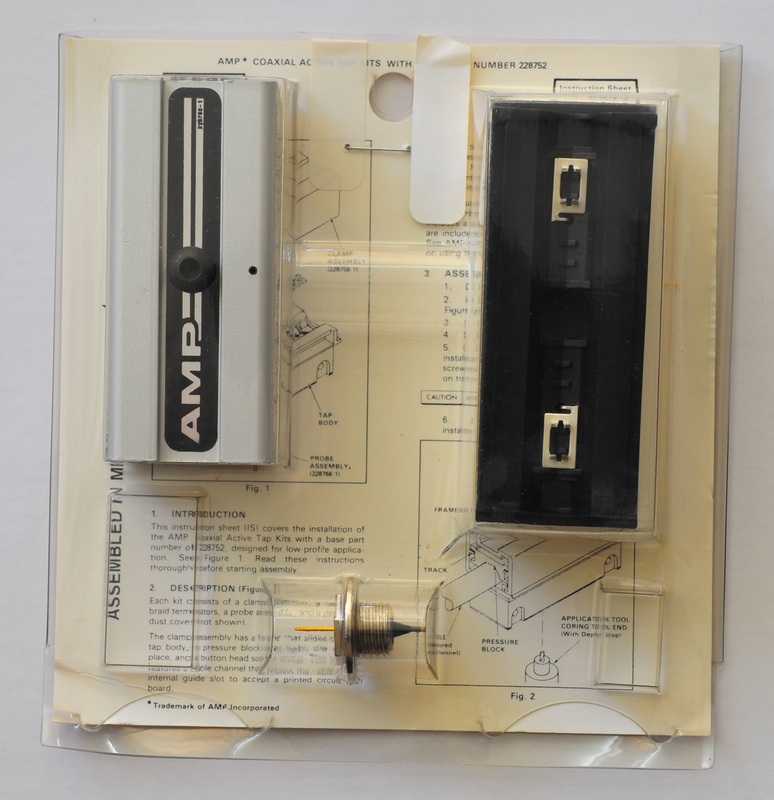 I remember those vampire taps cost a fortune back in the day and the drop cables to the back of the PCs and Sun Workstations we used were a pain in the bum. Happy days though! But were you aware of the optimal distance multiple between terminator/drop and then drop/drop? There was no such animal as a network engineer, thick-net LAN was first used to replace proprietary point to point cabling to connect mainframe line-printers to the mainframes. Mainframe engineers installed the LAN and it was viewed as being owned by and an extension of the mainframe. The cable was cut at the drops “bee-stings” were considered not “man enough” (yep really) for the mainframe. A M/F engineer told me that the drops should be placed at (1.5M (I think) multiples) and indeed the cable came with these intervals pre-marked. This was where the highest/lowest point of the wave length would be if every connection/terminator obeyed the rule. Later a bridge was installed to connect a new “building” segment to the one under the mainframe false floor. All this predated TCP/IP some of the big mainframe companies collaborated to agree ISO/OSI and were busy doing that whilst the real world ignored them and the defacto TCP/IP route-ability was evolved. I was a struggling CTO trying to keep a service running during all this discourse. Impressive job. I was actually a programmer writing office automation software in the Pentagon in the early 1980s. Tracking correspondence and documents seemed to be the biggest issues of the day. We would also use postscript to print documents for individual government employees. This is exactly like filling in fields on a PDF file today and printing it. We would use a Xerox Star and a program would input the data to the document, then the postscript file would be printed over the 10BASE5 network that connected the printer and Xerox Star. I did all of this while I worked on one of these networks in the Pentagon in the mid 80s. I also got bored easily. So I helped the operations folks on numerous occasions. As one of your previous commentators said, there was no such thing as a network engineer. The network supported the Secretary of Defense went about 1.5x around the building. Each segment was at least 300 meters long with bridges connecting the segments. Each bridge had 2 drop connections and cost a minimum of $7,000 on the GSA schedule. At that length and with that many users(There were at 300 active users, any usage over 20% caused huge problems). The network ran near the SecDefs office. In 1987, I got to attach a tap to an area near the SecDefs office for his secretaries Xerox Star. I was the only one who had a tie that day. I got to walk into the Sec Defs office and marvel at how good a job the set designers on No Way Out had done in recreating it. I had seen the movie the previous weekend. So I have done real taps and seen idiots short out segments. The cable contractors in the Pentagon left loops in communications closets so you would go in and look for open black marks with free tap space. I have also seen other idiots put 10 taps in a 10 foot segment. Also, each type of equipment had it’s own communications protocol. DECNET was for Vax. Forget what the Star used, But I am sure it was proprietary. Also, you are 100% right about the slides on the drop cables. They can loose on a regular basis. The work around was to buy cheap drop cables and replace the equipment end with standard screws. If I were doing this, I would try to find some vintage equipment. Also see https://www.cisco.com/public/scc/compass/ap/tasks/task_bg_ethernet.htm for a bridge. A USB to 10Base5 MAU is the pinnacle of retronetworking madness. Bravo. I started my career tapping 10Base5 cables. If you end up in Silicon Valley, I’ll buy you a beer and tell you the stories. I can also take you to Weird Stuff Warehouse, where you can still find 10Base5 gear for sale. Great project. Yeah, you totally are on the mark about the slide latch connectors on the AUI drop cables. Due to the weight of the cables, they would fall out a lot. In the back of a DELNI (shared hub) for example you might touch a drop cable by accident and it would pop out of the DELNI, bringing your network down. We ended up removing the latches, drilling a hole through the connector, and inserting our own screws so we could tighten them down.